My wife came home with a little surprise for me from Central Market on Saturday. She bought a package of bratwurst from the Smokey Denmark Sausage Company of Austin, TX. According to their website, they've been around for 35 years, but I don't think I've ever heard of them. Although, that's not really a big surprise since I don't live in Austin and there are dozens and dozens of sausage companies in Texas. 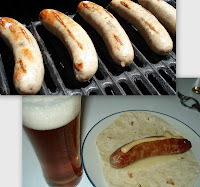 The package indicates the bratwurst are made with beer from Live Oak Brewing. We fired up the grill on Sunday after the torrential downpours had disappeard and tried them out. I have to say that they were probably some of the best brats I've ever had. I'll certainly have to look for them and other products from Smokey Denmark. I wrapped mine in a fresh tortilla with a slice of swiss and some stone ground Dijon mustard and enjoyed it with an Independence Freestyle Wheat. Delish!